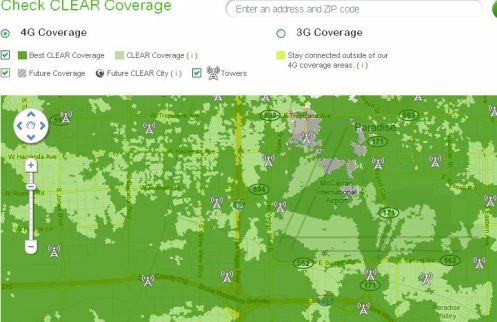 We’ve long been fans of Clearwire’s extraordinary honesty in its network coverage maps — and it appears the nascent national provider of WiMAX wireless broadband services has taken another step recently, adding radio tower locations to its coverage maps. While the new feature (which only seems to show up if you zoom way in on the maps, to street levels) may seem uber-geeky to some, for potential consumers it’s a rare bit of honesty from a wireless carrier, giving customers yet more data from which they can make an honest, informed purchasing decision. We first noticed the new (UPDATE: Clearwire says it has been live since Aug. 31) feature last week while scrolling around the Las Vegas coverage map in order to corroborate some network field tests we conducted last week (more on that in a later post). In one area of town we were surprised to get a low (under 2 Mbps) download test of the Clearwire network but with the new “see the towers” data we were able to determine that the place we were testing from (a Starbucks store in a brand-new ghost-town corner strip mall on Vegas’s west side) was actually almost perfectly located as far away as possible from the Clearwire towers in that part of town. No idea if Verizon and AT&T will follow suit when they launch 4G services, but judging from the companies’ current “coverage maps” for 3G, there won’t be any street-level detail like Clearwire’s network clouds and now, actual tower locations. In the past, we’ve heard carriers say that publishing such information would put them at a competitive disadvantage — which is really a bunch of hooey because in cities like Vegas you can basically drive around and see all the towers anyway, plus most companies are all co-located on the same sites so they and their competitors already know where all the antennas are. What Clearwire is saying — to potential customers — is that it’s willing to give up some important information before any sale is made. Is that a trust that should be rewarded? With nothing really to lose and everything to gain, it’s a good gamble for Clearwire and another win for the wireless consumer.